Whether founded in the late 19th or early 21st century, ABHE institutions have this in common: they emerge from and spawn spiritual movements. Eternity Bible College founder Francis Chan put it this way: We are not so much looking to make waves as to catch waves. Studies and statistics suggest that the North American church is on the ebb, spiritually stagnant and culturally marginalized, in stark contrast to the vibrant state of the church in many other places around the world. Yet, on ABHE campuses across North America a hopeful rising tide surges. God is raising up a remarkable new generation of spiritual leaders who love God boldly and serve Him courageously. While many of our graduates pursue church-related occupations, many others take their place in professional, commercial, and civic leadership callings marked by a biblically-rooted and spiritually vibrant Gospel pre-occupation. 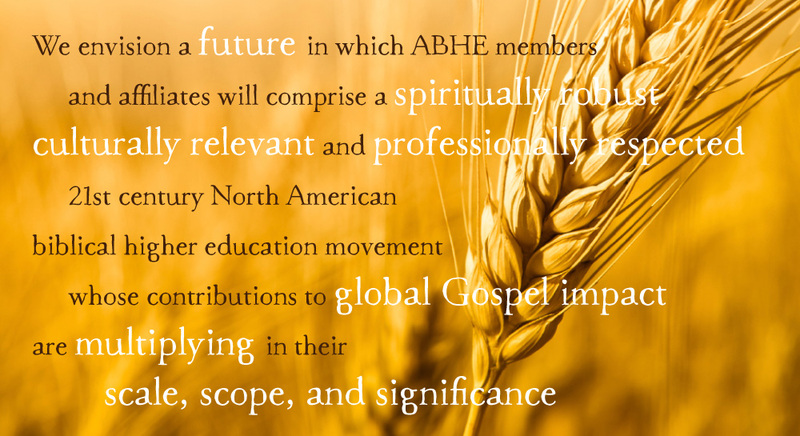 As biblical higher education institutions large and small respond to fresh stirrings of God’s Spirit, ABHE is poised to boost the buoyancy of its growing family of institutions. In addition to our commitment to quality assurance through accreditation, we have developed and deployed extensive means to enhance the professional skills of key institutional leaders and expand educational, operational, and technology resources in order to strengthen educational effectiveness, secure institutional resilience, and seize spiritual opportunities.